As a candidate for a homeschool curriculum reviewer, I received a free copy of a unit on firefighters to try out in our homeschool classroom. I received this copy in exchange for an honest review of the product and I have received no other compensation. The unit is titled: "When I grow up I want to be... A Firefighter." It is produced by The Old Schoolhouse Magazine. There are many other titles available including: doctor, farmer, chef, and veterinarian. I received the unit as an 82 page e-book and I was a little overwhelmed by the size. I quickly realized that it was not necessary to print all 82 pages. I printed about 30 pages of text and activity sheets. A parent that does not mind reading off of the computer could get by with printing even less. The unit is designed for ages 4 to 10. My boys were very excited to try something new in our homeschooling day. 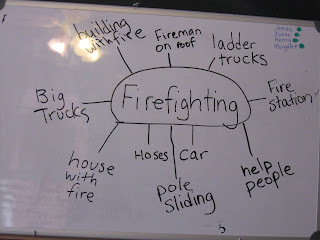 We started by talking about what we knew about firefighters. We made a chart on the board. I then proceeded to read the unit to the kids. My kids love to be read to, and the first part of the reading was 16 pages and contained several pictures and graphs. Although only 16 pages, it was full of facts and figures. Every now and then it would return to a story format, but even with the kid-friendly tone, Henry (my four year old) was quickly off on another activity. Isaac (my six year old), followed in about five minutes. Only James, my third grader, dutifully sat through the reading. At the end of this reading section there was a little quiz, which we completed orally. Although they seemed disinterested while I was reading, I was very impressed with how much of the information the kids retained. After the quiz, there was a creative writing lesson with several prompts. I let Isaac and Henry draw pictures, and James wrote a short story and drew a picture. The second day we read the next section which was about robots. My kids adore robots, but the section was a little too factual for their ages. Again, only James was able to stay focused and engaged. The section ended with an extension activity to make your own robotic arm. We are definitely going to complete this activity after the weekly trip to the store to get disposable cups and craft sticks. The rest of the unit contains worksheet activities and other extension activities. The worksheets are definitely designed for the older learner with corssowrds and word searches. I really appreciated the handwriting sheets. The sentences pertained to the unit and came in print and cursive writing; perfect for a family with writers of different levels! There was a sheet full of words for the children to define, and a glossary was included for reference. We did this part orally, and I gave the list of words to Henry for handwriting practice. The kids liked the non-worksheet extension activities best. Many were similar to putting on a play. 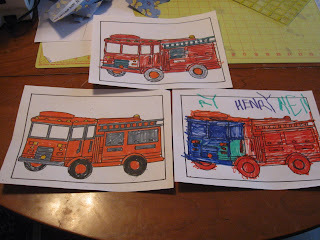 With various household items we would create a problem that my little firefighters would have to solve. In addition to problem-solving, there were also many cooking ideas. Kitchen science- YUM! James demonstrating the bucket brigade. Completed coloring sheets included in the lesson. *It was a self-contained unit. I didn't need to supplement with additional resources from the library. *It had engaging extension activities that got the kids out of their desks and allowed them to work together to solve problems. *There was an answer key for all the worksheets and questions within the unit. A big time-saver for me! *There was more than enough present in the unit to supply a weeks-worth of homeschooling, especially if you access the list of web links included in the back of the unit. Without the links we covered: Reading, writing, spelling & vocabulary, handwriting, math (older student only), art, and science. *The unit offered an opportunity for us to talk about fire safety in the home. *The text in the unit was too advanced for the younger learners. *There wasn't any sort of lesson plan available for how to present the material. *The worksheets were all designed for the older student. *The coloring sheets were simple and the kids thought they were boring. Overall, I thought the unit was worth our precious classroom time. It was great to get away for our school routine and complete our school lessons under the context of a firefighting unit. 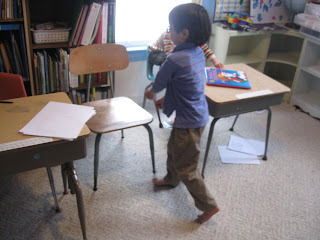 Fire safety is important for every child, and it was nice to incorporate an entire unit into the lesson, instead of just instructions on what to do if there is a fire in the house. The cost of this unit makes it even more appealing: only $8.95! Click here to order this or the other available units in this series. Great review! Good luck, I'm glad you applied...psst, I'll put in a good word for you.